While justices like Moore will surely face the ire of their pro-gay counterparts who will likely view this as “outright defiance and treat it that way,” there is a formidable arsenal of support from Americans who oppose it on a religious basis. “Millions of Americans who voted that marriage is a union between a man and a woman are not simply going to throw their beliefs away…this fight will continue on regardless of [how] the Supreme Court rules,” Brian Brown of the National Organization for Marriage says. I [feel] that that is stepping on my right of religious freedom. Are we, as a nation, compromising the critical freedom of religion in our efforts to be “fair” to everyone? On Wednesday, the Jordanian government agreed to release a convicted terrorist in exchange for one of their own air force pilots that had been captured by ISIS. The pilot was captured a month ago and ISIS threatened to kill him by Wednesday if Jordan did not agree to release the terrorist. However, Jordan has not received confirmation that their pilot is still alive and as a result, have not yet released the terrorist. This is a very complicated situation. I don’t understand why ISIS might have the killed the pilot before they said they would if they had wanted to do an exchange. 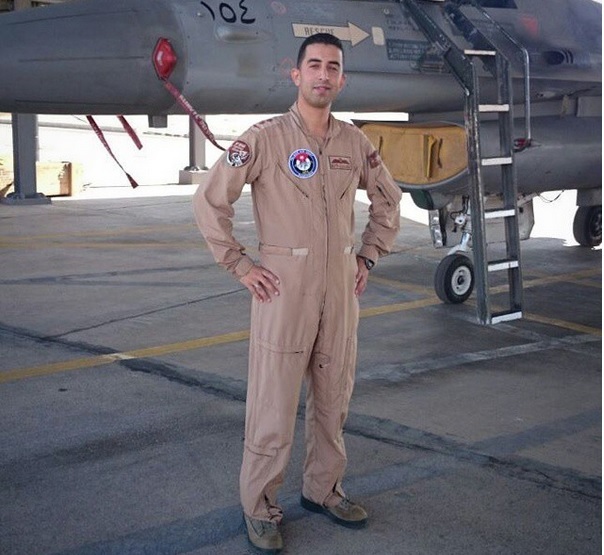 It will be very interesting to how the Jordanian government reacts if the young pilot has already been killed. The bigger question for me is what every one thinks about giving a terrorist back to ISIS. Obviously, you never want to see one of your own citizens killed, but I feel like giving in to a terrorist’s demands is a dangerous thing to do. We can’t afford to give ISIS any more power than they already have. How should have Jordan responded to these terrorist demands? Is it ever acceptable to negotiate with a terrorist group? Fidel Castro, who was assumed to be dead after keeping his silence on the new deal brokered between the United States and Cuba, has written a letter expressing his disdain with the American government, but offering hope that a productive relationship will exist. In the letter published in the Communist’s official newspaper, Castro states that Cuba will always strive to work with all the world’s people even if they oppose each other politically. He supports his brother’s decision to receive permission to reinstate diplomatic ties from the proper channels within the island nation. Although his letter touched on many topics this is one that many people have waited to hear. Castro has not been seen in public in over a year and many presume him dead. Elder Russell M Nelson is a world renowned surgeon and pioneer in open heart surgery. His innovations have guided the growth of cardiovascular surgery and his expert advice to training surgeons is to read the scriptures. As an aspiring surgeon I feel a little deflated at his advice. Some of us are not going to ever be an apostle of God and therefore don’t have that extra inspiration to help us. Additionally, many surgeons don’t believe in God. However, God has not abandoned us! With the invention of the 3-D printer cardiothoracic surgeons no longer have to wait until their patient’s chest is cracked, heart stopped and fileted open to know exactly what cuts and stitches need to be made. 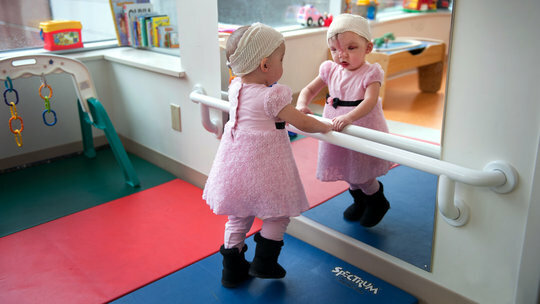 Surgeons at Boston Children’s Hospital recently used 3-D technology to plan and practice a complicated and rare surgery giving a young girl the gift of normalcy. Though these surgeons are the best in their field, every body is different and the 2-D images were insufficient to help them know if the surgery was even possible. Each model was $1200, but what well spent money if it means your surgeon is more confident and knows what they are up against. 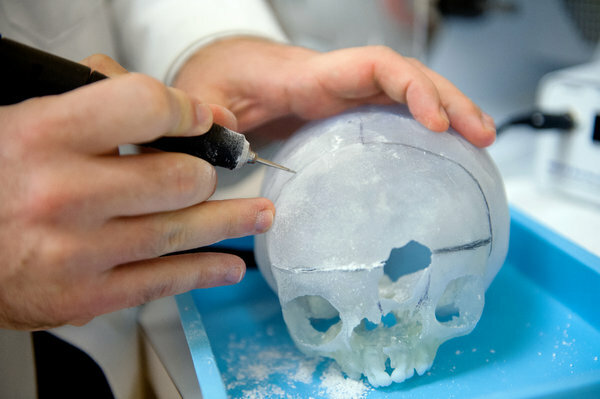 For surgeons in training, this will mean we can plan procedures and make cuts and mistakes without killing the patient. Further, think of the innovation this will breed! New ways of stitching, seeing different options in a bloodless environment. Perhaps someday your surgeon will have already performed your surgery on an exact replica of your unique body. On the first page of the Wall Street Journal on Wednesday the 28th, an article describes the impact of the strengthening U.S. Dollar. It sounds nice to have a strong dollar, but if you’re a major exporter than it can hurt your bottom line. Over the past few years companies like Caterpillar and P&G have been looking overseas for growth and recently have noted that earnings abroad are being hurt because the strengthening dollar makes American goods more expensive. On the other hand, goods that are imported are becoming cheaper, which is great for a lot of Americans. For example, Oil has plummeted over the past few months, which is attributed to many things, but a strengthening dollar is one of them. Right now is a great time to take a vacation to Europe considering the Euro is trading under $1.15, down from nearly $1.50 a couple years ago. Jordan is set to release Sajida Mubarak al-Rishawi, convicted in a 2005 bombing in Amman that left 57 people dead, in exchange for captured Jordanian pilot 1LT Moaz al-Kasasbeh. It is unclear if Japanese journalist Kenji Goto will be part of the exchange as well. Is this the right move or an act of appeasement? In an impossible cost benefit analysis, is one person worth endangering many by releasing an unrepentant terrorist? One could argue that swaps like this only encourage more hostage taking, but IS is already pretty big on taking (and executing) anyone it can. Also, if fighting terrorists rally is a game of whack-a-mole, does it really make a difference to put one more bad guy (or bad gal in this case) back on the streets? It sure makes a big difference to Lt. al-Kasasbeh and his family. To be sure Jordan is paying a steep price for their pilot, but this isn’t so surprising and I think it reflects well on the Jordanians. As the U.S. learned in the swap for Sgt. 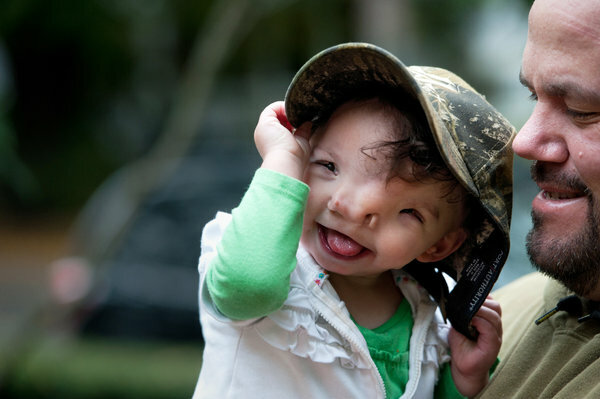 Bowe Bergdahl, ‘our side’ always gives up more in these situations. The reason for this is very simple: we value on human life infinitely more than the other guy. It is nonetheless a risky and controversial move. 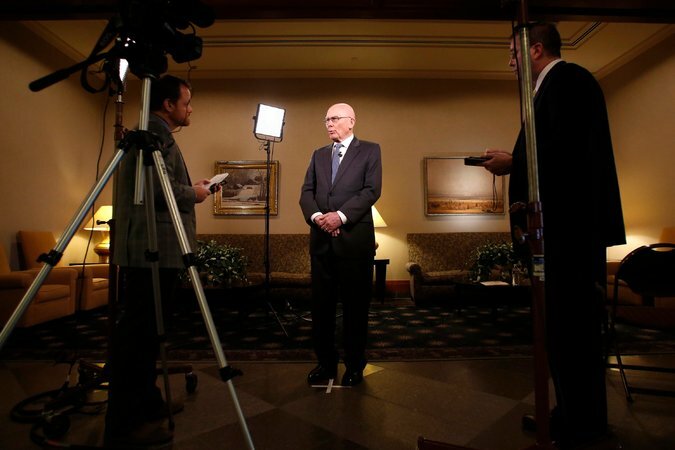 Yesterday morning the Church of Jesus Christ of Latter-day Saints held a news conference at their headquarters in Salt Lake City to affirm their support for anti-discrimination laws for LGBT citizens as long as religious freedoms were also being protected by similar laws. The Church is trying to walk the line between supporting LGBT rights and still maintaining their support for religious liberty to refuse service to LGBT people because of personal religious beliefs. The Church is definitely making a step in the right direction by supporting anti-discrimination laws, but how will this affect the way the Church is viewed throughout the world and by the LGBT community at large? Will this lead to continued support for the LGBT community or is this the end of the line? He cut his trip to India short in order stop in Saudi Arabia, where there are rigid restraints on women’s freedom, for a short visit in light of the recent death of King Abdullah. Also joining him on his visit were American government officials including Condoleezza Rice, John Kerry, and Sen. John McCain. As a recent New York Times article points out, this trip highlights Washington’s disposition to put national security priorities above human rights concerns. 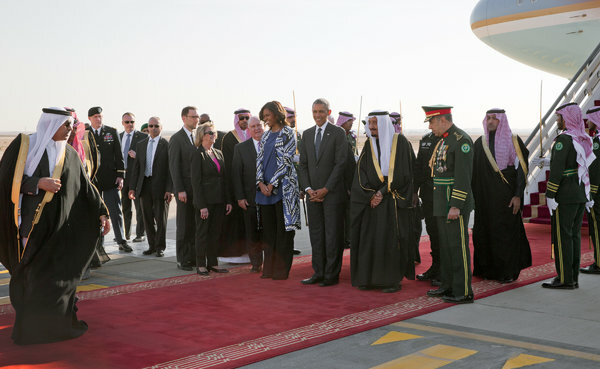 President Obama and first lady, Michelle Obama, visit Saudi Arabia to offer their condolences. President Obama could not give the same discourse to Saudi Arabia as he did to India. What makes Saudi Arabia different? Why does it stand out from other countries that struggle with major human rights violations; countries that we have cut off and placed sanctions on? It is important to note the history of the United State’s relations with Saudi Arabia, and to take into account the history of the area. In a volatile region, Saudi Arabia is one of our strong allies who has joined the U.S. in counterterrorism efforts, is actively opposing the ‘Un-Islamic State in Iraq,’ and back in June agreed to join the United States in airstrikes in Iraq and Syria. President Obama has mentioned that “sometimes we need to balance our need to speak to them about human rights issues with immediate concerns we have in terms of counterterrorism or dealing with regional stability.” Education can be a better weapon to fight radicals than investing in airstrikes and foreign involvement, but do security concerns trump human rights and equality? Greece: Do voters vote for what’s best? Do voters vote for what’s best? Greece’s voters elected Syriza to power this past Sunday. Syriza ran on a platform primarily aimed at the reversing unpopular steps taken by Greece’s government following their financial crisis and bailout in 2010. Greece was in dire financial straits in 2010 until it reached agreements with a number of creditors (both countries and central banks). Greece had been spending much more than it took in and accruing massive amounts of debt that it could not sustain. In order to receive money to bail them out, Greece agreed to a number of austerity measures namely raising taxes and cutting governmental spending. Syriza ran on a platform promising to reverse many of the terms of Greece’s bailout. They plan to end spending austerity by creating new spending programs including one aimed at the poor. Syriza also plans to seek forgiveness for portions of their debt from their creditors. These campaign promises were extremely popular with the voting public with Syriza winning a resounding 36.6% of the vote. The next challenger, New Democracy, received 27.8%, followed by a host of smaller parties. This vote signals that Greece’s voters are ready for a change, but do they know what change is best? On the other hand, austerity measures allowed Greece access to bailout money it badly needed. The spending cuts and economic overhaul brought Greece’s finances back into line and helped turn around a tanking economy. These austerity measures are also the only thing that continues to give Greece access to financial markets that it sorely needs to continue to have a functioning economy and banking system. The question still remains: do voters really vote for what’s best? Do they vote for the party they truly believe can help turn around their country? Or do voters favor the candidate/party that will give their personal lives the most noticeable change without thought of what is best for the country as a whole? 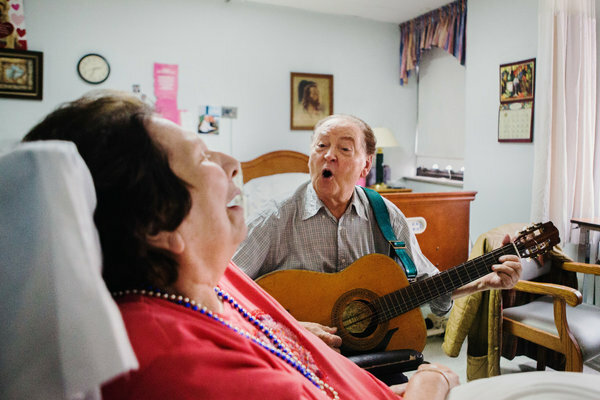 In a front page article of the New York Times, nursing home patients find themselves victims of strong arming tactics by their care facilities. While most of these cases remain under the radar, sealed from public view by the courts, Dino and Lillian Palermo’s case has made national news. Mr. Palermo, is faced with a guardianship petition submitted by the Mary Manning Walsh Nursing Home demanding full legal power over his wife, a resident at this Catholic nursing home in Manhattan, and full control of her money. This came as a result of his disputing nursing bills when the co-pays doubled.